As presumably everybody already knows, the trailer for The Hobbit: The Desolation of Smaug was released yesterday. The Hobbit: An Unexpected Journey, the first of a forthcoming trilogy based on J.R.R. 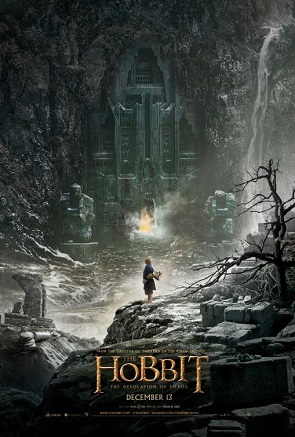 Tolkien’s novel, opened in cinemas back in December of 2012, and has now taken over $1 billion dollars at the box office. With all the fanfare behind the franchise and excitement starting to build already, I think it is fair to say that by this time next year, The Desolation of Smaug will have come close to that figure again, and perhaps have even exceeded it. An Unexpected Journey, directed by The Lord of the Rings director Peter Jackson, delivered a more light-hearted Middle-earth (in comparison to Middle-earth during The Lord of the Rings trilogy) and it is more than likely that part two of The Hobbit, which Jackson helms again, will be portrayed in a similar vein. For me, this is by no means a bad thing — the book itself is certainly less downbeat than its successors and therefore the film does not need to be either. The problem I had with An Unexpected Journey was its less-than-unexpected runtime, which approached almost three hours. Jackson had stated in interviews before the film was released that he was looking into using excerpts from Tolkien’s other related writings (Unfinished Tales and such), and as it turned out, he used a few more than he probably should have (such as the scene with bumbling wizard Radagast the Brown and his energetic rabbits). Something tells me The Desolation of Smaug will have a similarly long runtime, but at the end of the day if it means I am sitting for an extra hour in a cinema, why should I be complaining? The trailer for The Desolation of Smaug certainly looks more action-packed than the previous instalment, as Martin Freeman’s Bilbo Baggins and his troupe of companions continue on their journey to the Lonely Mountain and an impending meeting with the dragon, Smaug. We see an array of new characters making an appearance in the trailer (such as Lost’s delightful Evangeline Lilly as Tauriel) and old faces returning (the ever-popular Orlando Bloom is back as the, well… ever-popular Legolas). Stephen Fry finally gets his debut in the franchise as the Master of Lake-town and Martin Freeman’s Sherlock compatriot, Benedict Cumberbatch, plays the dragon — who better (than Kanyon… never mind)? Aside from those four, many of the previous actors from An Unexpected Journey are set to reprise their roles, signalling the return of people like Ian McKellen as Gandalf the Grey, Richard Armitage as Thorin Oakenshield and James Nesbitt as Bofur the dwarf. We are even getting the pleasure of another Andy Serkis performance as Gollum. Particular events outlined in the book which stick out in the trailer include the barrel scene, the company’s arrival and travels through places such as Mirkwood and Dale, and the eventual confrontation with Smaug. We even get a greater glimpse of the dragon right at the end of the trailer (as opposed to just an eye in the previous film). Once again, it appears that the graphics team and visual departments have all worked wonders on the actual viewing aspect of the piece, as the detail exuding from the trailer alone looks magnificent, an element common in Jackson’s films — they tend to be truly cinematic and spectacular (take The Lovely Bones as an example). One thing is for sure, at the hands of Peter Jackson, regardless of runtime or unnecessary scenes or any number of frames per second, The Hobbit: The Desolation of Smaug is certain to be a visually stunning, exciting and hugely enjoyable watch for all.